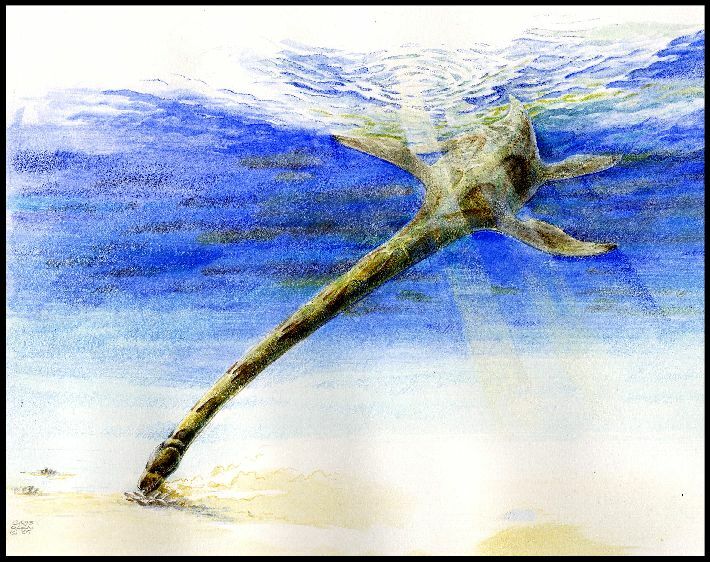 Left: Artist concept of a bottom feeding elasmosaur. Copyright © 2005 by Chris Glen. C.R. McHenry, A.G Cook, and S. Wroe, 2005. Bottom-feeding plesiosaurs. Science 310: 75. The bizarre, long-necked plesiosaurs are among the most recognisable animals of the Dinosaur era  and an ongoing source of inspiration to devotees of Loch Ness monster myth. Traditionally, scientists thought that their amazing necks were an adaptation to the hunting of agile, free-swimming fish and squid. But this long-standing idea has now been challenged by new Australian finds which show that plesiosaurs had a surprisingly varied diet that included bottom-dwelling, clams and snails. This raised the question - how was this supposedly specialised fish-eater digesting such hard-shelled prey? The head was missing in the North Queensland specimen, but no known elasmosaur had teeth that were capable of crushing hard-shelled animals, explains Dr Steve Wroe. That the gastroliths were important to these animals was demonstrated by a second Queensland specimen whose stomach contents included pieces of crab and 135 gastroliths. A good set of stomach stones was obviously worth travelling for, says Cook, These gastroliths came from a region of volcanic rocks at least 300 kms from where the fossil was found. The article is: C.R. McHenry, A.G. Cook, and S. Wroe. Bottom-Feeding Plesiosaurs. Science, 7 Oct 2005. How old were the two fossil plesiosaurs reported in the Science paper? The two specimens are from rocks that were laid down at the bottom of a shallow inland sea about 100 million years ago, during the Cretaceous Period, when the dinosaurs still roamed the land. Are plesiosaurs a kind of dinosaur? No. Although they lived during the Age of the Dinosaurs  known to scientists as the Mesozoic Era and made up of the Triassic, Jurassic, and Cretaceous periods  plesiosaurs were a completely different type of reptile. Despite rumours of sightings in various Scottish lakes, plesiosaurs are now thoroughly extinct. Is an elasmosaur the same thing as a long necked plesiosaur? Elasmosaurs were one family of long-necked plesiosaur  there were at least two other families of plesiosaurs with long necks, but the elasmosaurs were the group with the longest necks of all. Elasmosaurus itself, after which the family was named, was more than 10 metres long and had a 7 metre neck containing 72 vertebrae. In contrast, most mammals  including giraffes  have only seven neck vertebrae. Is the first time stomach contents have been found in elasmosaurs? No, stomach contents have been found before, in particular from North American specimens. These show that the North American elasmosaurs also swallowed stomach stones, and apparently traveled distances of several hundred kilometres to find them. But the prey items preserved in these fossilised stomach contents have mainly been fish and squid-like animals, with benthic molluscs apparently being a very rare part of the diet in these elasmosaurs. Were plesiosaurs the only animals that swallowed stomach stones? No. Modern animals that swallow gastroliths include penguins, sea-lions, and crocodiles. Birds that eat tough plant matter also use gastroliths, although in this case its clear that the stomach stones are helping the herbivore to grind its food, and its thought that some plant-eating dinosaurs did this as well. But the role of gastroliths in the water-living animals has always been controversial. What was the controversy about the role of gastroliths in plesiosaurs? Essentially, there are two theories of gastrolith function in marine animals. One theory is that the stones help air breathing animals to control their buoyancy in water. The problem with that idea is that its not certain that a couple of kilograms of pebbles is going to have much effect on the buoyancy of a two-tonne reptile. The other theory was that the stones helped them digest their food, but this theory had its problems as well  until now, all the modern and extinct marine animals that use(d) gastroliths are mainly fish and squid predators, and fish and squid are not exactly the most difficult things to digest. Benthic  animals living on the sea bed. As opposed to nektonic, which are free swimming animals such as fish and squid, or planktonic, which are organisms which simply drift along in the water currents. Mollusc  the group of animals to which snails (gastropods) and clams (bivalves) belong. Both of these groups are mainly benthic, but the molluscs also include the cephalopods  squid, octopus, and cuttlefish. Lots of cephalopods were nektonic (i.e. free swimming). Belemnites and ammonites are groups of cephalopod that are known from abundant fossils world-wide, but which are now extinct. The North Queensland plesiosaur specimen that had lots of benthic molluscs in the gut also had some belemnite fossils, showing that it was also taking free-swimming prey. Colin McHenry: Gained a B.Sc. Hons (majoring in evolutionary biology and ecology) from the University of Southampton, UK in 1992, and currently teaches Environmental Biology and Human Anatomy at the University of Newcastle, NSW. He is in the final stages of completing a doctoral thesis on Kronosaurus, a large pliosaur (short necked plesiosaur) from Queensland, through the University of Queensland. His research interests also include the biomechanics of predators  some of this work will be featured on the ABC Science program Catalyst later this year. Alex Cook: Following completion of his PhD (on some of the earliest reef building organisms) he started work as Assistant Curator of the fossil collections of the Queensland Museum. He is now Senior Curator, and combines his research interest in fossil snails with field work state-wide. He has collected most of the important dinosaur and plesiosaur fossils found in Queensland over the last decade. Steve Wroe: Completed a PhD at the University of NSW studying Australian fossil mammals and is the worlds foremost authority on the evolution of carnivorous marsupials such as the marsupial lion Thylacoleo. He has published over 40 technical papers and numerous popular articles in the field of palaeontology. Wroe is currently working at the Key Centre for Microscopy and Microanalysis, University of Sydney, examining questions that surround issues ranging from the extinction of Australian Megafauna to the biomechanics of fossil and living carnivore skulls and the reproductive biology of extinct flying reptiles. Wroe and McHenry collaborated earlier this year in an analysis of mammalian carnivore biomechanics which formed the basis of an upcoming Catalyst feature and a recent National Geographic documentary, Super-Predators. (Wroe, McHenry, and Thomason, 2005. Bite club: comparative bite force in big biting mammals and the prediction of predatory behaviour in fossil taxa. Proceedings of the Royal Society of London, Series B, vol 272, pp 619-625).